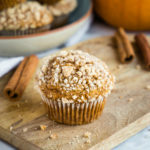 These Pumpkin Spice Streusel Muffins are the perfect fall treat or snack! They're bursting with pumpkin spice flavours and they're so easy to make! Preheat your oven to 350 degrees Fahrenheit and prepare a 12-cup muffin tin, lining it with paper liners. In a large bowl whisk together the pumpkin puree, eggs, sugar and vegetable oil. Add the flour, baking soda, salt, cinnamon, cloves, ginger and nutmeg, and stir everything together with a rubber spatula just until no streaks of flour remain (don't over-mix!). Divide the batter evenly between the muffin cups and set aside. In a medium bowl whisk together the flour, sugar, and cinnamon. Add the melted butter and combine with a fork just until a crumbly mixture forms. Top each of the unbaked muffins with a spoonful of the streusel mixture, and bake at 350 degrees Fahrenheit for about 17-20 minutes, or until a toothpick inserted into one of the muffins comes out clean. These muffins are best enjoyed the day they're baked, but they do store in an airtight container at room temperature for up to 3 days.